Because they manufacture all their own products, Deanta can guarantee that all of their timber comes from the same source. This results in a seamless match between your new door and the skirting and architrave. The Traditional skirting and architrave is designed to work well with Deanta's period doors. - Skirting: 147x16mm x 3.6 Metres. - Architrave: 80x16mm (covers both sides of the door). - Real American white oak veneer. - Solid FSC certified MDF core. 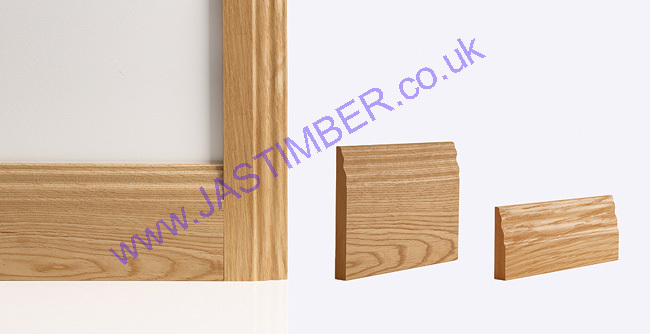 Deanta Oak Traditional Skirtings & Architraves have a clear lacquer finish. - We cannot exchange Oak Traditional Skirtings & Architraves after order - Deanta Oak Traditional Skirtings & Architraves are supplied as a Special Order. Carrier Delivery of Deanta Oak Traditional Skirting & Architrave is not possible. E. & O.E. see T&C - We do try to keep prices and specifi­cations Oak Traditional Skirting & Architrave correct, but mistakes can be made!